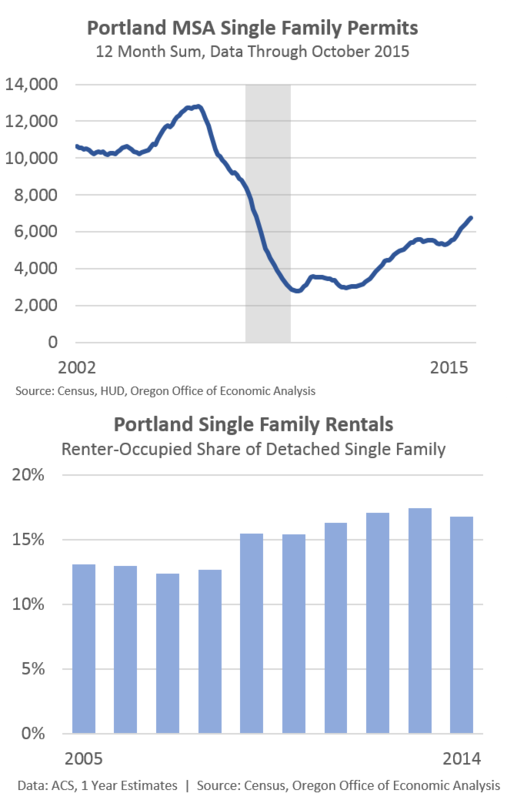 Demand for housing in much of Oregon has returned in full force with population growth picking up and household formation increasing. So far the supply side of the market has not kept pace — for a variety of reasons — resulting in the nation’s lowest vacancy rate, rising prices and eroding affordability. 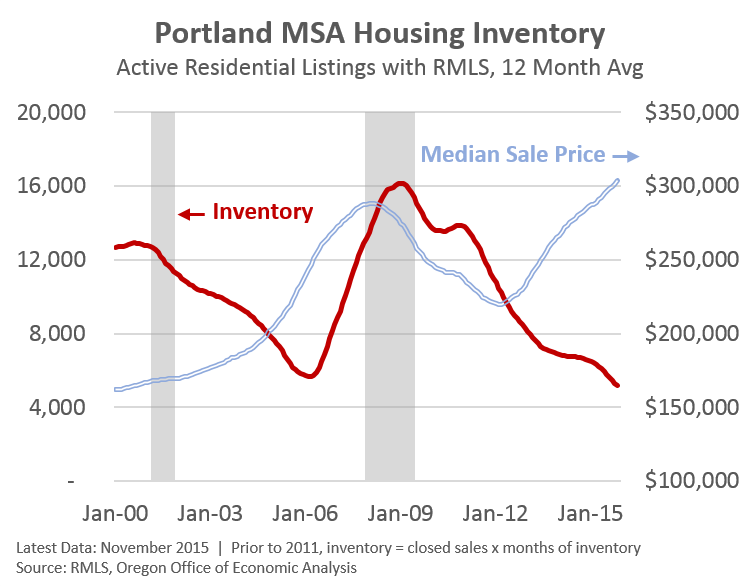 What follows is a brief rundown of housing inventory and the future pipeline for the Portland MSA, although the state’s other metropolitan areas see similar trends. Median sale prices are at record highs. While it is widely known that inventory is low, most usually discuss the months of inventory metric. However, not only is that low (2.0 in October) the actual number of active residential listing with RMLS is at a literal low with data back to 1999. Never in the past 15+ years have there been fewer active listing in the metro. The last time the market had a somewhat similar number of listings — 2005 — the population was 275,000 less than it is today with approximately 100,000 fewer households. Few homes for sale with strong demand is the recipe for high housing costs. What about the pipeline for the future? Like the nation, the recovery in new construction is somewhat mixed. Multifamily construction is all the way back to pre-recession levels and has been so for some time. However single family construction remains low, with only sluggish growth in recent years. It is improving, expected to continue to do so, yet remains well below historical production rates. Even so, local permit data shows that the market is roughly 50 percent multifamily and 50 percent single family. As our office detailed before, some of this is due to the changing tastes of consumers, some due to demographics and some due to financial conditions of buyers, developers and creditors. Not all single family is owner-occupied either, as a larger share of homes today are rentals than before the crisis. Yet, some of low levels of new construction is also due to supply constraints like land use restrictions and the lack of available, ready-to-build lots. The lack of developable land is a national issue as well, not just a local one. Lending dried up for land development along with the financial crisis, resulting in a dearth of lots today. It takes time and money to get land ready for new construction. The good news is such lending activity is picking up, which should boost the housing supply in the future to meet the demands and needs of a growing population. On the multifamily side, the pipeline continues to look strong. The best numbers come from Barry & Associates who track apartment construction across the region. They look at both proposed projects and those under construction. 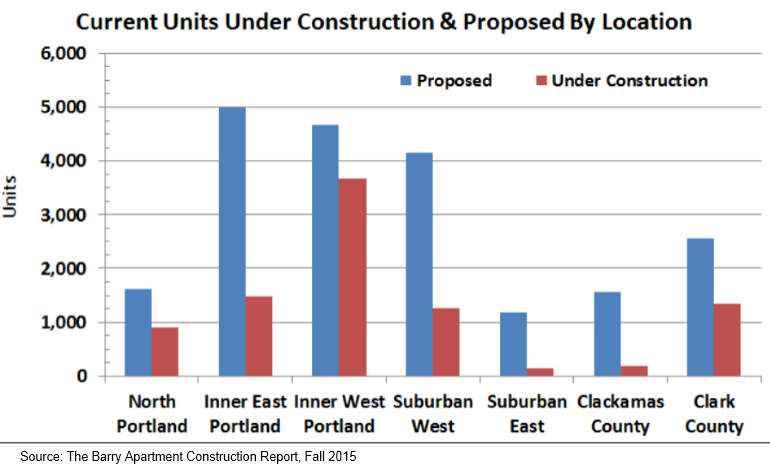 We know active construction and the projects that have applied for permits remain at relatively high levels. However, as Mark and Patrick Barry show, the number of proposed units continues to be robust. Low levels of new construction relative to population growth in recent years means that the market needs all of these proposed housing units and more to maintain some level of affordability. Portland, along with other fast growing places like Denver and Seattle, have historically been able to build just enough housing to keep prices from reaching the levels seen in the most expensive markets. With population growth accelerating in recent years as migration flows return with an improving economy, let us hope this pattern continues and affordability worries ease. As economists, our office is hopeful that the supply response is coming, given the prices and the demand.